Two men pray at an early morning service at La Lomita chapel, a historical landmark in Mission, Texas. 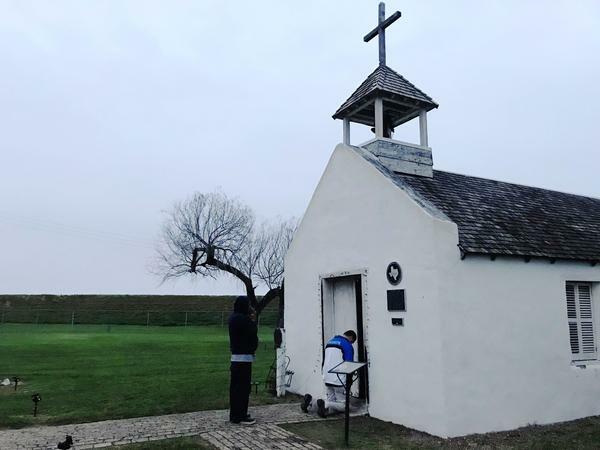 Before sunrise and illuminated by lantern light, the faithful gathered to pray, as they have many times before, at La Lomita chapel in Mission, Texas. The chapel is made of simple white adobe, and Roy Rogers' song "Blue Shadows On The Trail" plays from a battery-operated radio in the chilly pre-dawn gloom as Rev. Roy Snipes makes his way down the aisle to preside over the Mass. The choice of processional music is an unusual one, but this congregation expects it. Father Snipes is known around here as the cowboy priest. He normally wears his wide-brimmed hat, and on the altar with him are two of his rescue dogs. On Friday, his prayers are politically pointed. 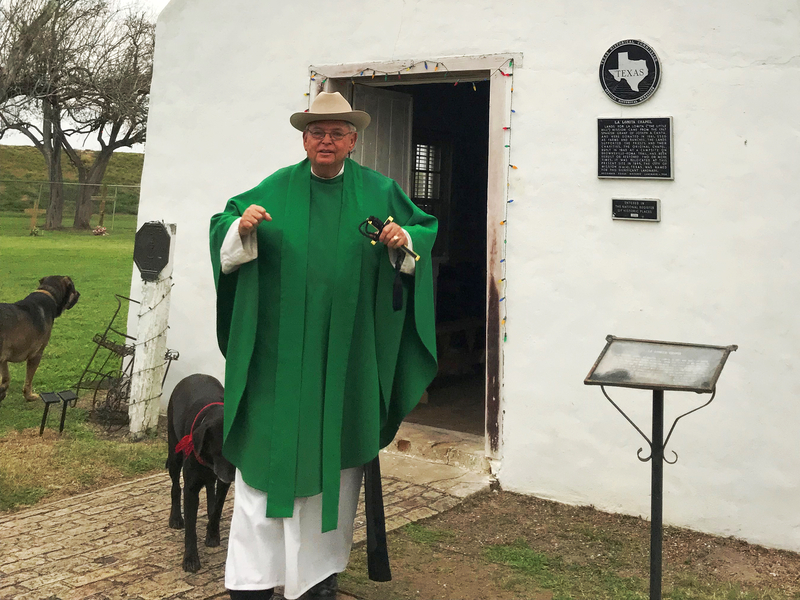 Father Roy Snipes with his dogs outside of La Lomita chapel. He intones, "Oh Lord, you made our hearts and you know us and you know our affliction and our astonishment at the arrogance of our own government desecrating the sanctuary of our homeland ... ignoring our rights as free Americans and sons and daughters of Texas, South Texas. We pray to you." The local Catholic diocese is mired in a legal battle with the U.S. government over the chapel's land, which is right next to the Rio Grande River. 25 miles of President Trump's proposed border wall, funded in 2018 when Republicans still held a majority in the House, are slated to go through Hidalgo County, where Mission is located. La Lomita — which means little hill — has been here almost since the southern border was created, following the Mexican-American War in the mid-19th century. It's part of a series of missions established by the Catholic Church to maintain a presence on the U.S. side of the new border. The town of Mission — now with a population of around 80 thousand people — grew up around it. In last year's appropriations bill, money was allocated for "levee fencing" on the land at La Lomita – a massive 30-foot wall on the north side of the property, complete with access roads and cameras. After the Mass, Snipes says he believes a wall will desecrate this place. Those who came to pray here agree. The Mass ends outside the chapel with a hymn in Spanish, and the congregation gathers around a bonfire amid the twisted mesquite trees. Rene Villarreal is a 51-year-old electrical contractor and a father of five sons. He says this is more than just a spiritual place. Generations have prayed here. "I mean you're here in the mornings," Villarreal says. "And you just wonder how many of your ancestors have been here praying for the same things we're praying, and asking our God to help us and give us the strength to go through another day." Like many residents here, he has deep roots on both sides of the border. People here switch easily between Spanish and English: The town of Mission is in Hidalgo County which is 92 percent Latino, and many of the residents have family in Mexico. "Well, look around," says Armando O'Caña, mayor of Mission, who attended the service. "Look at people just eating breakfast here... under some of these trees here in this nice park here in Mission. You know. There's nothing unusual. You know it's normal. It's a normal event. So there's no crisis here on the border." It was the same message he delivered to President Trump when he met him last month during Trump's border visit. O'Caña says once the wall is built, it will cut off access to city services, like 911, for Mission's residents on the other side. "That's not right," he says. "How can I protect them? How can we get even water and sewer on the other side? Yeah, they say they will have some gates and all that, but you know when seconds count, you still have to go through the gate." The latest legal battle over the land between the government and La Lomita took place last week. The local diocese tried and failed to stop the government from surveying the chapel land. The altar inside La Lomita chapel. Mary McCord is a senior litigator at Georgetown Law's Institute for Constitutional Advocacy and Protection, and she's one of the lawyers representing the diocese. 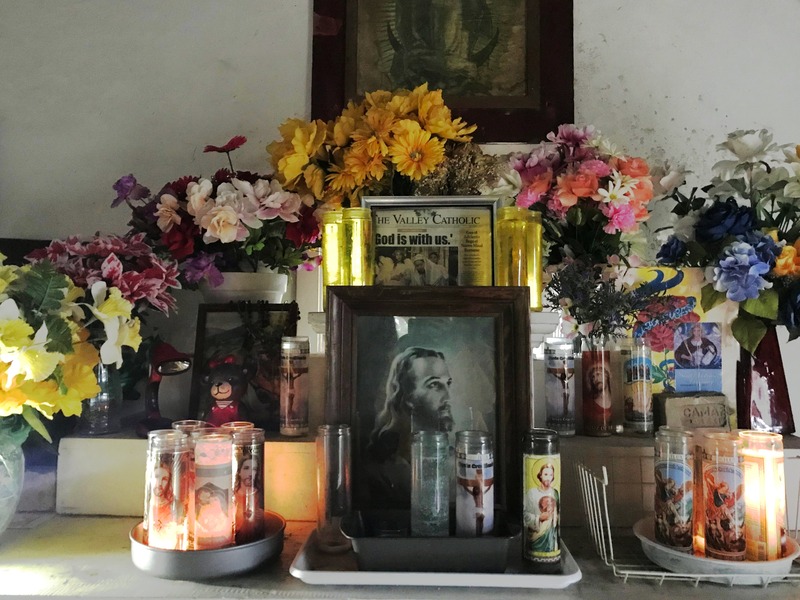 She says the government has the right to claim private property for public use — but La Lomita is a chapel, not just private land. "What's different about this," she says, "Is that government can't take action that substantially burdens the free exercise of religion and that is not only part of the First Amendment, but it's also part of the Religious Freedom Restoration Act." 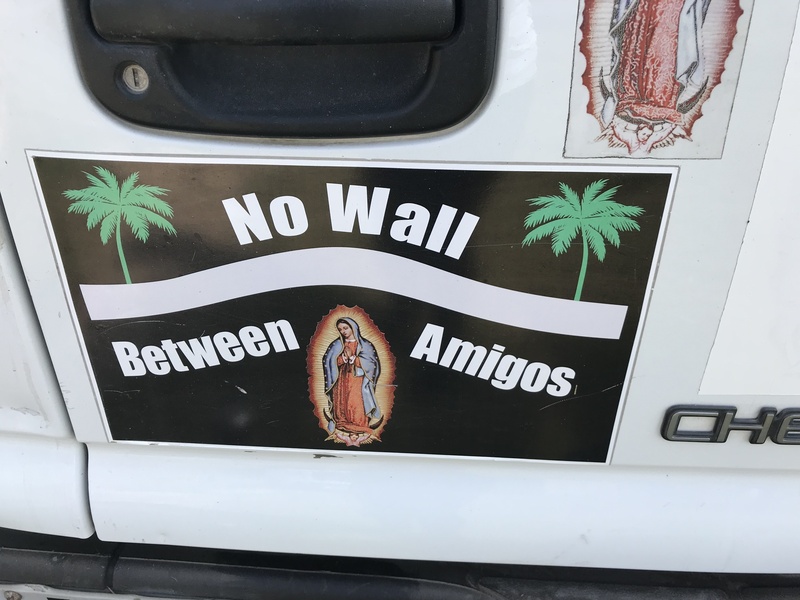 She says the church argues that the wall is inconsistent with Catholic teachings, "which includes this principle of universality that all people are equal and need to be treated as such, and provided with basic necessities of life. Whether it's food and shelter... and according to the teachings of the pope migration is an important piece of this." The next court battle will be over the government's plan to actually seize the land and start building. Driving down the proposed path of the border wall, there's an RV park where Texans come to enjoy the warmth in the winter. There's also a riverside restaurant and a lot of farms and houses. It's peaceful. But there's also the constant presence of Customs and Border Protection, with watchtowers and helicopters, as well as sensors dotting the river bank. The area encapsulates the debate over border security — specifically, what kind does this part of Texas need? Monty Awbrey, pictured here in his home office, is a businessman and supporter of President Trump's proposed border wall. For businessman Monty Awbrey, the answer is clear. "Our national security is at risk," he says. 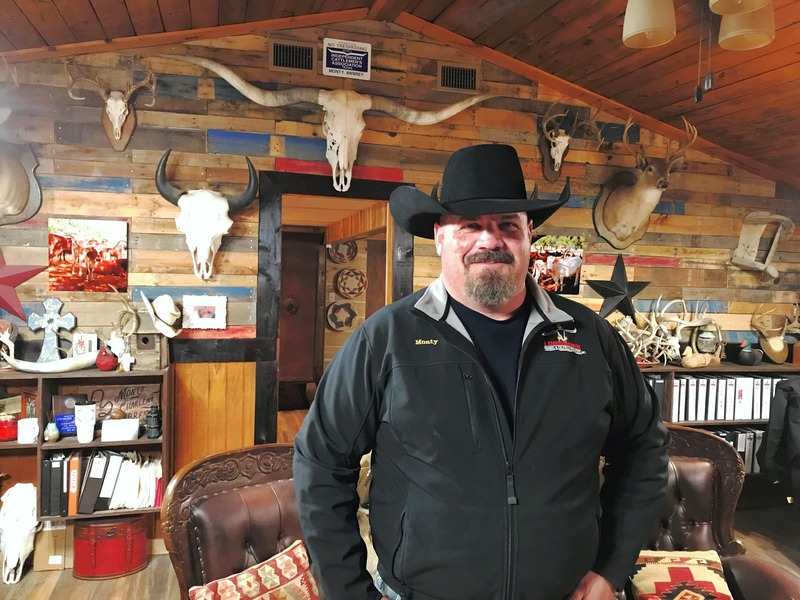 He runs his construction business from his ranch, where he also raises horses and cattle. He also met with President Trump when he was down here last month. And he made quite the impression. "When I asked President Trump to sign my name tag," he says, "I asked him, you know, would be OK if I gave him a gift. And he said yes, and I just kind of reached out and started undoing my belt." Imagine the scene: Monty Awbrey, a really big guy, digging around his pants in front of the president. "Everybody kind of lost their head like whoa. And [Trump] looked at me like, what are you doing?" he recounts, laughing. He was actually going for his rodeo championship buckle, which reminds him of his late father. He wanted Trump's son Barron to have it. It's no surprise Awbrey was invited, since he's a vocal supporter of the president's signature campaign promise. Last month, he threw a barbecue for border patrol agents working without pay during the shutdown. "Each one of those agents I got to meet, I shook their hands and talked to them, thanked them for their service, and I asked them their opinion of the wall," he says. "Out of all those 250 agents, not one of them was against it." "It is a humanitarian crisis," he says. "Whether the mayors or local law enforcement want to say so. They're not in the rural areas out here. They don't see what goes on, on a day to day basis. ... They've never had [migrants] walk up on their doorstep at three in the morning begging for help." After his meeting with the President, Awbrey says he got a lot of hate on social media, where he was called a racist. He says those labels don't work on the border. His wife is Latina and he speaks fluent Spanish. And he's friends with Father Snipes — he was even baptized at La Lomita six months ago, when he became a Catholic at his wife's request. "Father Roy [Snipes] and I discussed this," Awbrey says. "And he knows what side I stand on and he understands my views and I understand his as well. You know Father Roy is a very compassionate man. I love him to death and I'll do anything in the world for him." A bumper sticker on Father Roy Snipes' car. It's the border way, Awbrey says. You can stand on different sides of an issue and still respect each other. Customs and Border Protection declined to comment for this story. They did confirm that no work has begun yet on the Mission section of the border wall. Back at La Lomita chapel, the post-Mass meal is winding down. And 72-year-old Leonor Ochoa is sitting at the table enjoying the food and company. "We live in a neighborhood where everyone shares," she says. "Like right now, in this moment, we're a lot of different families, and all of us are coming together and sharing our tacos, and our lunch. We are united." She says wall or no wall, that won't change.